In September 2015 photographs of three-year-old Syrian, Alan Kurdi, circulated worldwide. Taken by a passer-by, the photographs clearly depict his small lifeless body which had washed up on a beach in Turkey after the dangerously overcrowded boat that he was travelling on with his family capsized. The highly distressing nature of these images, which dominated the front pages of newspapers internationally, instigated lengthy coverage of the current and continuing refugee crisis, which has seen large numbers of residents from Middle Eastern and African countries fleeing devastating conditions of war. Though it had been reported previously in the media, this specific image forcibly epitomised the refugees’ desperation, putting into perspective the extremity of the conditions that such families were escaping when, in order to leave them, the young and vulnerable were put at such grave risk. The death of this young boy triggered an overwhelming outcry of public compassion and anger, which forced David Cameron’s Conservative government to U-turn on a refusal to accept more Syrian refugees and to announce that the UK would accept and resettle 20,000 more over the next five years. Quietly, just over one year later, the Dubs scheme which sought to resettle lone child refugees was halted. This later news story made a very small murmur in the British press and was consequently met with very little public protest. The coverage dedicated to these two connected news stories in proportion to their corresponding content is indicative of an approach employed by mainstream media as to how print space is prioritised – in that sensationalism takes precedence. While the images of Kurdi resulted in a positive but short-term change in refugee policy, refugees have been more broadly dehumanised in the press, for example in an act of unequivocal racial hatred, a columnist for the Sun referred to refugees as cockroaches. It is against this backdrop that Richard Mosse’s solo exhibition ‘Incoming’, at the Barbican’s Curve Gallery is viewed (Reviews AM405). The work is described at the entrance to the gallery as a ‘humanist art form’, which indicates its stance against the growing anti-immigration discourse that has coincided with the rise in far-right politics in the West. At the centre of Mosse’s exhibition is the hour-long, immersive three-screen film Incoming, 2014-17, which has been shot using reconfigured advanced thermal-imaging technology that was intended for far-distance border surveillance. In contrast to standard video recording equipment, these cameras are incredibly heat-sensitive, producing black-and-white footage that gives its representations a ghostly, oversaturated and other-worldly appearance, which Mosse has enhanced with a disquieting rumbling soundtrack that comprises drone and field recordings by composer Ben Frost. 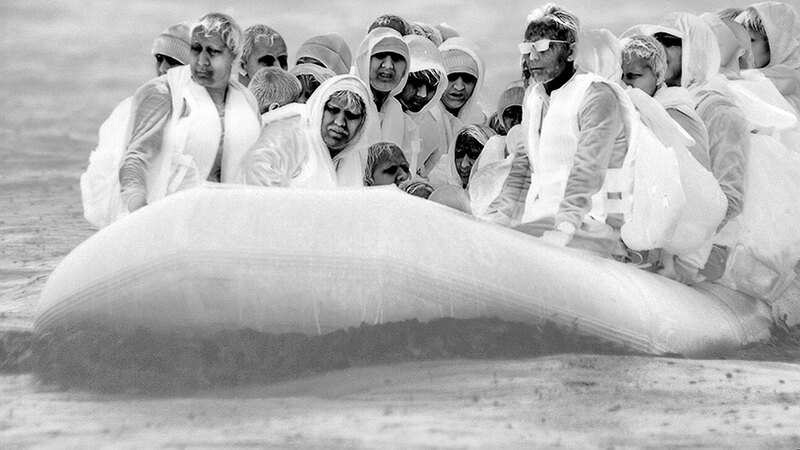 The film depicts scenarios that are similar to international news reports of the crisis – large numbers of refugees dangerously cramped in precarious boats and rubber dinghies, the rescued waiting in line while flanked by the military, in addition to compositions of footage that is of both an extreme and mundane nature: drowned bodies being recovered by coast guards, resuscitation attempts on the unconscious pulled from the water, which are framed amongst recordings of young children playing, adults praying and general, everyday interactions in refugee camps. This collision of extremes darts from vivid to haunting, beautifully melancholic to harrowing. But where one might view these effects as having positive outcomes in terms of raising awareness, they are more akin to the sensationalism of mainstream media representation of the crisis: the effect might be exhilarating but it is also highly troubling. While undoubtedly masterful in its drawing out of an instinctual, emotive response to hypnotically aestheticised, highly distressing footage, which is heightened by its high production values and commercial-gallery-ready presentation – Mosse has largely received accolades for this work, receiving several four- and five-star reviews in the national newspapers – I would argue that Incoming does not necessarily provide an unknown or even under-documented perspective on this current condition; rather, the film’s anonymous scanning of these journeys aligns itself with the problematic framing of the refugee crisis in mainstream media representation in that it regurgitates, in the same fleeting manner, representations of suffering and violence that are already in wide circulation. Film works that overlap the genres of art and reportage have, more generally, been historically used by artists to interrogate the subjective framing of the representational process itself. Through mediation, the presentation of ‘authentic’ reality in its entirety is acknowledged as an impossible endeavour. When Hito Steyerl, in her 2007 essay ‘Documentary Uncertainty’, states that ‘the political importance of documentary forms does not primarily reside in their subject matter, but in the ways in which they are organised’, she highlights the importance of investigating the workings of power relations in representation and how they are materialised. Mosse’s work, however, rather than subverting the typical representations of the crisis – challenging the way visibility is granted to some and not to others – reads as uncomfortably complicit with the standardised practice of the spectacularisation of non-white suffering. Recent works that have more successfully sidestepped the singularity of mainstream representation of conflict include The Drift, 2017, by Maeve Brennan, presented at Chisenhale Gallery earlier this year (Profile AM406). Here, the unfolding war in Syria forms the backdrop to quiet observations of three semi-fictional characters based in Lebanon who are connected through their care for historical relics and scrapyard objects. Gianfranco Rosi’s documentary Fire at Sea, 2016, also handles the subject of suffering with great sensitivity. For instance, in one scene the injuries sustained by a teenager are described by a doctor whose incensed disbelief and anger seeps through his hardened professionalism. Compellingly, it is the doctor’s response which drives the narrative as opposed to the visual depiction of the direct suffering itself. The filmic technique that distinguishes Incoming from standard documentary journalism is Mosse’s unconventional choice of recording equipment. Categorised as a weapon under the International Traffic in Arms Regulations (ITAR), the high-tech camera’s use is intended as a metaphorical reflection on the violent nature of the tools used against those fleeing the harshest of conditions; its pointed repurposing intended to turn a dehumanising form of surveillance, which reduces its human subjects to flesh-and-blood targets, to humanising effect. In Mosse’s defence, the insertion of a human narrative into these mechanised images successfully challenges the historic regulation of footage selectively released by the military. As explored in Harun Farocki’s essay film War at a Distance, circulated footage of bombs falling and accurately hitting their targets during the height of the the Iraq War were deliberately devoid of human presence (Reviews AM333). The aim of this official footage was to sustain the illusion that the US/UK-led intervention had minor human impact. But in Mosse’s work, the analytic reduction of this form of capture is not overcome. Rather, the turning of a violent, mechanised gaze onto a narrative of suffering and extreme violence raises important ethical questions. When weighed against the strength of its moral intention and artistic merit, it reads as exploitative of the artist’s human subjects. Mosse’s decision to explicitly forefront the violent elements of the narrative can therefore be seen as further contributing to a harmful standard visual lexicon of conflict in which racial violence is inscribed upon black and brown bodies. Lauren Houlton is winner of the Film and Video Umbrella and Art Monthly Michael O’Pray Prize 2017. The Michael O’Pray Prize is a Film and Video Umbrella initiative, in partnership with Art Monthly. Supported by University of East London and Arts Council England. Subsequent to completing this response to Richard Mosse’s film, Paul Carey-Kent and Peter Suchin have both responded to each other’s views on the work in the Letters section of Art Monthly from issue 406 onwards. Their debate, the result of conflicting positions, expands in great detail the issues surrounding the aestheticisation of war and conflict, and further explores concerns regarding the ethics of representing the refugee crisis.